I am looking for a fast sports bike that won't give me chronic back problems on longer rides. Maybe a 600cc, but i hear that many bikes are uncomfortable to ride for long periods. Any suggestions? Thanks. Check out some of the 'naked' sports bikes like the ducati monster or Honda (i think) 616. They are sporty, but have a different riding position, somewhat similiar to a standard bike. I know at least the Monster is very comfortable to ride. I have a buddy that has a body pillow for when he takes his sports bike out for touring. It lays on top of the fuel tank, and he says he never has any back problems at all with it. Something to check out. He's a big fan of the BMW bikes, too, so you might want to test ride some of theirs. Any sports bike is uncomfortable for long distance as they were never built for that. But if you still want the power of a sports and the comfort of a retro then get a street fighter. Its a sports bike with renthol bars and no fairing. The power is there but the riding position is more upright. Borg, can you explain the idea of a streetfighter to me a bit more? i am not sure i am familiar...thanks. 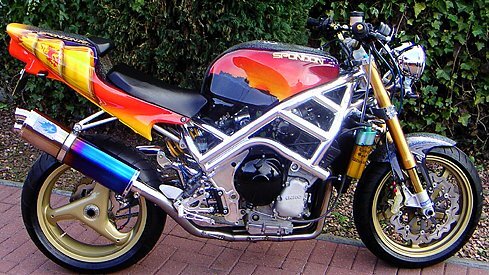 A street fighter is a sports bike without the fairing. I have left two examples below. The riding position is upright but the power of the sports is still there. They were also called stunt bikes as the power they have and the comfort. I dont know where you can buy one in the states but most people make them for themselfs. The two below are an example of what you can do to them. Street fighter sounds more like what you are after, just watch out for the wheelies as they do that very easy. there is a website/forum dedicated to street fighters, http://customfighters.com this is a growing trend in the US now. Its developing a cult like following. Every sportie I know wants to build one after seeing their first. These are incredible machines, some are very basic, with rattle can paint jobs, and some are like Borg's, incredible works of art, and of course everything in between. 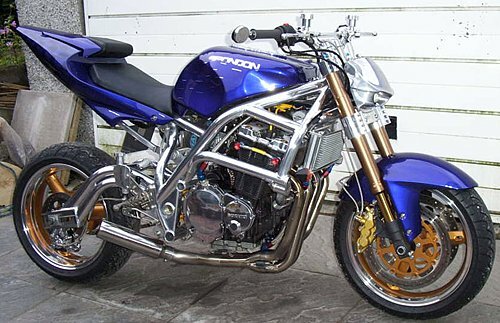 If its fast sport bikes with an upright riding position, a street fighter will fit the bill.